Alberta Mobile Power Systems is an active partner across many industries in western Canada. Their core business is renting electrical generation and remote lighting solutions to energy extraction and other firms that operate in the field far from power lines. Although AMPS has had an Industrial NetMedia-made website for a number of years, it was getting outdated and no longer reflected the growth in products and services the company had experienced since the site was first engineered. 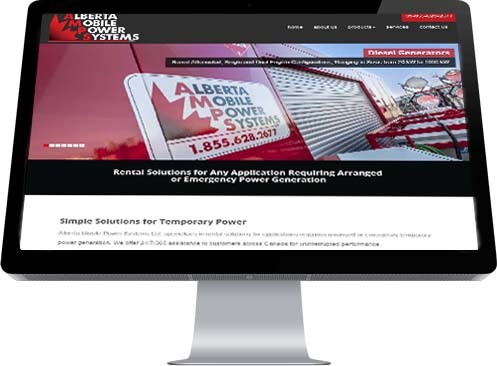 A gallery showcasing the rental units available from the company was deemed an essential addition, as well as new services and About pages. With the newly-added pages, a redesign was in order, providing the opportu nity to make the site more mobile-friendly; a feature not really necessary before portable devices became so popular for online searches and shopping.